I think it's safe to say that I have eased into this new year!! After an extra long weekend I'm feeling motivated and ready for the week ahead!! I mentioned that my mom flew up here on Thursday so I spent the day hanging out with her and my sister before they went to Vermont for the long weekend - we're actually headed there this coming weekend and I'm beyond excited for the fresh mountain air, but before that here are a few snaps of the weekend! Friday night Gary and I went to the Liberty Hotel for an impromptu night out with some friends. It's hard to not want to be a hermit in the winter so we give ourselves pep talks before going out to psych ourselves up #oldladystatus - you know something like - just think how amazing it will be when we get home and get comfy 😂 <-- please tell me we're not alone here! Probably the most productive Saturday I've had in a while and actual meal planning happened! I made margarita chicken fajitas from the Cravings cookbook & oh my gosh was it amazing!! We also started the show Goliath on Amazon thanks to a few of your recommendations. I'm not normally a Billy Bob Thornton fan, but I love any legal drama so I'm glad we gave this one a go! After Eataly Boston opened in November we wanted to wait for the crowds to die down before we attempted a trip back. Apparently the crowds will never die down since it was just as packed on Sunday as it was the weekend it opened. There are three different areas to eat - two require reservations that can only be made in person & the one la piazza is first come first served. We snagged a table at one of the bars & enjoyed a leisurely lunch with arancini (fried risotto balls), a charcuterie board with an assortment of cheeses & meats capped off with Tajarin - hand cut egg pasta with truffle butter and parmesan. Yes, tasted just as amazing as it sounds! blanket scarf out of stock - similar || sole society bag || over the knee boots || coat || jeans - the comfiest pair I have ever owned! If you ever make it to Boston, I can't recommend a stroll through Beacon Hill enough - especially on Charles Street. It's my favorite neighborhood in the city & all the little alley's that lead to the most charming homes - beyond picturesque! At this point you've seen these boots & bag on repeat in basically every single outfit post because I just can't get enough. The boots were one of the best purchases I made at the end of last year - I can walk miles without so much as a pinch. I have a what's in my bag post coming up soon & I'm going to be sharing just how much you can fit into this small bag! Bonus weekend day gave us time to do all the things without feeling like we're spending precious weekend moments. We finally hung some artwork in the hallway for the start of our gallery wall, made a huge dent in our PCH itinerary & scooped up the cutest little faux marble side table from TJ Maxx!! Closed out Monday with my standard Bachelor viewing! I know a lot of people aren't liking this season, but at least it's not nearly as boring as the ones in previous seasons!! Are you watching the bachelor? Have you picked your winner yet? I bet those chicken fajitas from Cravings were amazing! I still have lots of recipes I want to try! All of your eats this weekend look amazing- I'm hungry now! Ha. I'm obsessed with this season of the Bavhelor... Sure it's a little trashy and I don't think Nick is really looking for love (more like fame) but I'm obsessed! I'm calling Danielle M & Vanessa as the final 2! I have that cookbook but have yet to try any recipes, I will need to look in there today and see what I can find for this weekend. I will be catching up on The Bachelor today, I really only care for 1 girl, but I can't remember her name!! I think she is a nurse, but she is blonde with short hair-super cute! Have a great day! Oh I need that cookbook!! How cute do you look in that darling neighborhood! LOVE your scarf and boots. Oh yes, totally get the hermit thing. We have to motivate ourselves to get outta the house. This past weekend it only include a trip to a brewery and a market, but hey it's something, lol!! Have a great week love! Awesome weekend, you meal plan for the week looks a lot like my weekday meals do! I was so excited for nick to be the bachelor but I've been underwhelmed so far! Your Eataly spread looks so delicious!! Sounds like it was a great weekend! Vermont for the weekend sounds amazing I can't wait to hear all about it. All of your food looks amazing and it sounds like a nice weekend. I love your pep-talk. We are such hermits in the winter too! I will admit that I am not all in on The Bachelor but Nick is finally growing on me. I always hate these first few episodes - so awkward! Sounds like you guys had a great weekend, glad you enjoyed! I could spend hours wine-ing and dining in Eataly. Their pasta is so freaking good! Oh my all that delicious food and that scarf! Also I would totally need to psych myself up to go outside because cold. I hate being cold. But coming home to comfy pants does sound amazing! Looks like a great weekend and thanks for hosting!! I love that Sole Society bag! It's so pretty in the forest green as well. I give you so much credit girl. When it dropped into the 30's last weekend we totally bailed on getting up to do pictures because it was "too cold". I have truly turned into a Floridan! Yum your meal plan for the weeks sounds awesome! That food from Eataly has me drooling over here! Still need to make it there! I'm watching the Bachelor but I could do without Corinne, hoping she gets sent home soon! All this food looks AMAZING!! And I am loving your blanket scarf! Good for your for doing all of your weekend meal planning! I'd like to be better at that... Cheers to the long weekend!! a productive and fun AND relaxing weekend - what could be better! and yay for mom visits! you're gonna have so much fun this weekend :) i am TOTALLY in agreement about talking myself into going out when i lived up north haha. it's like ok plan the outfit to be cute but warm but not too many layers, etc etc lol. i think i need those boots btw! oh lordy, those fried risotto balls look AMAZING. yum. good job on your meal planning, i have been failing at that lately, just too hard lol. and yes, we are such hermits in the winter. it's harder/easier? in louisville because there's nothing to do, not like boston, so it's just easier to stay in. but as we are currently living in a basement, i feel like we need to get out more just to get some vitamin d and not go crazy. haha. Looks like it was a great long weekend! All this food is making me so hungry haha! The risotto balls look so amazing along with the fajitas! Yay for meal planning for the week, too! Ugh, your Boston photos always make me want to come visit. So gorgeous!! I'm glad you two do the same thing. Caleb and I hardly leave the house in the Winter because of the cold temps, but its been pretty mild here in Ohio so we did venture out on Saturday, too! The food you made looks DELISH!!! Gimme all of that yummy looking food! So jealous. Glad you guys got in some fun and relaxation this weekend. I wish long weekends were a permanent thing, I'd be a much happier and productive person. LOL! 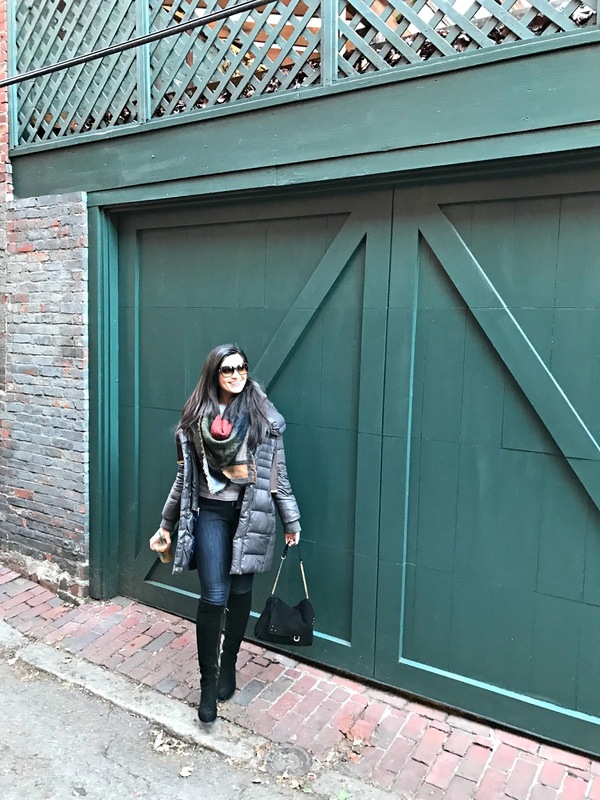 I just love those photos of you in Beacon Hill! Eataly looks so fun and delicious. Glad you had a good long weekend! It sounds like you had such a fun weekend! Eataly sounds amazing, what you guys ordered looks incredibly delish and I'm sure it was! I meal prepped too and it makes the week SO much easier!!! I don't have to worry about making pit stops to the market, which always delays dinner. If only I can do this every weekend, haha. Thanks for sharing, beauty, and I hope you have a wonderful day! PS: I LOVE that blanket scarf!!! Seems like such a fun weekend! I love the Liberty Hotel! I always want to be a hermit once winter starts until Spring starts. Isn't Eataly the best?! Love your cozy weekend look and I could agree more about the pull to stay in. With each year I become more and more of a homebody! Adorei as fotos! Pelo jeito o seu fim de semana foi bem bacana! I've been wanting to try Eataly since it opened! Glad to hear that it was worth the money. The Bachelor is anything but boring this season, and I'm loving it! I haven't watched yesterday's episode yet, but I'm very much looking forward to it tonight! Eately looks absolutely amazing and there is drool basically covering my screen right now. Charcuterie and fried risotto balls, yum! I hope that you're having a great start to your week! The perfect weekend! We totally avoid going out in the Winter and it definitely requires a major psych up, so you are NOT alone!! All of the food in this post looks amazing! I'm not a huge fan of Nick but he's staring to grow on me. It's definitely not a boring season so far! Ha we are exactly the same about going out in the winter! Those fajitas look delicious and I can't wait to hear all you have planned for your PCH trip! I totally get giving yourself a pep talk before going out in the cold! So true!! It's so hard to get out there sometimes. Your weekend looks delish - all of that food is making me hungry! I need that cookbook! All of the food looks so delish! I loved Eataly the one time I went, glad you could get in and get some food. All of your photos make Boston look so beautiful, I have never been and want to so bad! Glad you have a great weekend! Looks like a fun weekend! Meal planning always helps me. I love your outfit - especially the boots! Talk talk about the best weekend! You did so much, got to relax and ate tons of amazing food - win, win!! Love the pictures! You def had a great weekend! Vermont is one of my favorite states. It's gorgeous! Have a great trip. ummm we totally talk ourselves up to going out in the winter...once I'm home I like to be home and cozy hahaha. I loved Charles Street, so pretty...another favorite of mine was Commonwealth Avenue- so many cool homes around that area too. Glad you enjoyed your long weekend-have the best time in Vermont! What a fun weekend! I totally have to give myself a pep talk before going out too haha! Youre not alone! Love your outfit! That scarf is so cute! I hear ya about needing a pep talk to convince each other to venture out in the cold. I, for one, would opt to stay in but sometimes important celebrations are in order! My hubby just flew up there today until Friday. I'm slightly jelly that he gets to explore New Hampshire but then again I wouldn't be able to handle the cold. Looking forward to memorial weekend in Boston! I need to check out that cookbook, those fajitas look amazing!! As do those fried risotto balls, yum! You aren't the only one that has to talk yourself in to going out...guilty!!! Coming home and taking off my pants is my favorite thing about venturing out hahaha. Hope you have a great week!!!! Looks like a great weekend! I love the pep talk you guys do before going out haha. Since having kids that doesn't even work on me...strait to the comfies I go!! So amazing photos, love this post! Pep talks aside, you and Gary are one of the most exciting couples I know. lol Always doing fun things and trying lots of yummy food! Hey, maybe I should try these little "pep talks" myself? lol Have a great week! Yesss to pep talks to go out when it's freezing and dark! haha. Those fried risotto balls look delicious! Boston really is the prettiest city with so much charm everywhere!